Note: This design has been superceded by the 2.x Laser. There is a blog post on it, information on the wiki and a lot of discussion on the forum. 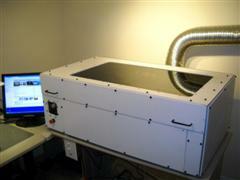 This was designed as a "self replicating" laser cutter engraver'. What this means, is all of the high tolerance complicated parts can be made on a laser cutter. So, once one laser cutter is done, it can help make others. All of the other parts can either be purchased or made with common home tools. This is not a mamby pamby little diode laser than can slowly cut through a piece of thin black tape. This will cut real materials, quickly. If you want to know what it can cut, go to a Ponoko type site and check out their materials list. 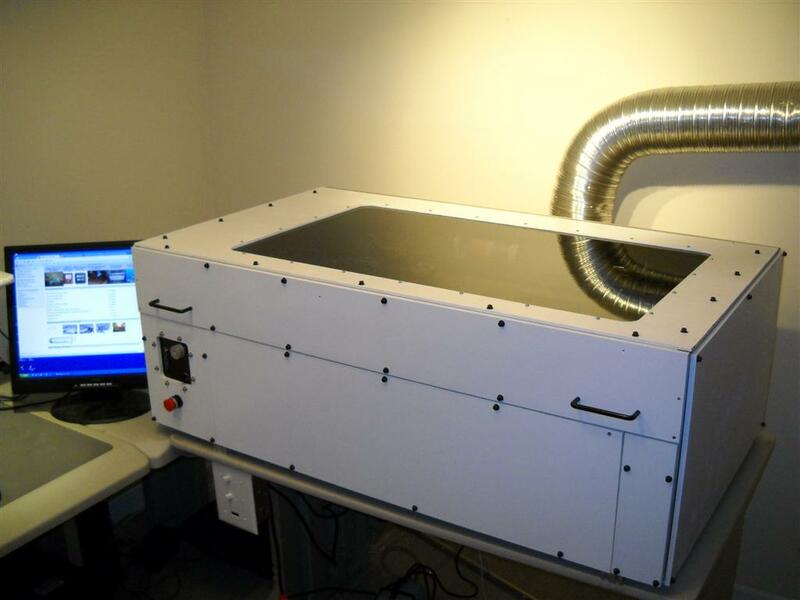 This was designed to be a dirt cheap, but fully capable laser cutter. Many of the material choices were made to satisfy that goal. I am sure many people will know of better materials, but usually at a higher cost. Feel free to substitute them .Almost everything that is not an off the shelf item, can be made with a laser cutter or router. To kick start the first generation of 'self replicating lasers, I have some kits located here. Suggest changes. A lot of the design comes from your input. Donate. Help fund the cost of the web site and costs associated with this project. It's that damn Mayan calendar! This is just the beginning. Sorry to hear that Bart. No consolation but I suppose it could have been worse and damaged your CNC stuff. We had a huge storm over the weekend. We got about 9 inches of rain in a few hours. That was more than the basement (laser workshop) walls could handle. I got about 1/2" of water everywhere. No expensive stuff was ruined, but the rug had to be torn out and an MDF bookshelf and entertainment center. Everything is up in the air (literally) until I get this sorted out. My bigger, woodworking/metalworking shop in the garage is unaffected. I have added kit references to the BOM. The row in the BOM is green if the part is in a kit. I started playing with a remote control for my laser when used in Mach3 mode. I wanted to try programming my new phone. Hopefully it will prove useful. I don't get much time to play with things like this so it will be several weeks before it is done. The link was pointing to the wrong folder. The link on the home page was correct and still working. That is the one I tend to use, so I probably would not have caught the problem myself. Bill of materials link is broken 404. The X travel is about 27". The Y travel is about 16". The Z can move a little more than 8". The actual usable Z is less because of material thickness and focal length...maybe about 6.25" usable. I was trying to figure out the maximum cutting area of your laser cutter design. I know you originally stated it as part of your goals by I was searching around and couldn't find it. Is it 18"x24"? I finally got the motors I ordered. I ordered them over 2 months ago. This was my first adventure into buying directly from a manufacturer in China. I will probably do a blog post on the adventures of buying them, but here is a quick overview. These were custom built to order. They do not stock them. This method lets you pick and choose from all the features and get exactly what you want, but there is a big lead time as they get the parts and schedule production. The prices are very good if you order in a decent sized quantity. There are a lot of other costs that really add up though. Shipping is very expensive, especially for heavy stuff like motors. There is also the cost of transferring the money. There is also the risk factor. Many people never see their parts or money. You need to pay all or some in advance so that is a risk. If you can establish that it is a actual, viable company, and your contact really works there that is a big start. I am going to sell the motors for just a little more than the whole endeavor cost me. The price should be better than you can get anywhere else, especially if you compare the features. If I sell all the motors in a reasonable time, I might make a much bigger order to really get the prices down. I have detailed drawings and step files of the motors on the drawings page. The smaller NEMA 17 motors are 0.9 degree step motor. This gives really high resolution and smooth motion. On my laser they could do up to 4000 dpi if you run in 1/16th step mode. I don't think the mechanics are that accurate, but, who knows, it could help with grayscale. Check the kits page for details. A couple people asked me where I got the hinge. I took this picture at Menard's. I am pretty sure this is the one I used. There is a nickel plated one (mine) for about $9 and a stainless steel version for $28. I used M3 flat head screws because this allows keeps the screw heads from contacting each other when the hinge is fully closed. I did not use all the holes, but it is important to use the outer most screws on both sides because the gas spring is under a lot of pressure when the cover is closed and tries to bend the hinge if there is no screw close to the edge. It just for piece of mind and it looks kind of cool. Most people who see my laser ask me where the fire extinguisher is. I saw this sign a while back. I took me a while to find the image. The one I saw was better because it showed the laser. This one just shows the sign. Obviously there was a very recent fire. Just for effect, I would singe the lower edge of the sign a little. I wanted to get a dedicated fire extinguisher for for the laser, but I kept forgetting to pick one up at the store. I mounted it directly to the side of the enclosure. It is ABC (and hopefully "L") rated. Just 1 thing I thought of with the table height adjustment. When I use mine at high speed I get a little shake from the inertia of the lens mount which shakes the table a bit. It's not much but it is enough to alter the accuracy of the engraving. I was going to put some ball bearing drawer slides attached to the frame vertically at the top and bottom so the frame would be held in place to stop the wobble and still allow the table to move up and down. The slides are cheap and would be a worthwhile addition in my opinion. To date I still haven't done this yet and as a quick fix I just press some rubber door wedges in the gap around the table to stop the wobble. I needed a little more height, so I used the nut. It is also nice that I can pre-assemble it. Brilliant!. This works great. Why did you use a nut, rather than a washer? I just got a piece of 1/8 Al, and tapped a 10-32 hole. I sanded down the screw as you suggested.. doesn't take much. Fits beautifully with no nuts, and just a single washer to space the bearing away from the Al plate. I do not use a shoulder screw. I use a #10-32 screw and sandwich a nut between the mounting plate (see the LASER_CAR_ASSEMBLY). #10-32 is almost exactly the right size. I have to sand down a half/thou on some of the screws. Typically a shoulder screw is not used because you never want the inner race to be able to spin. The more common method is the eccentric shaft (see image) that allows you to tension the bearing against the rail. Bishop Wisecarver is the inventor of these things. You can get some info there. These guys sell them cheap, but not the 3/16" size. f you really want a shoulder screw, I usually get them at Stock Drive. Do you have a spec/source for shoulder screws to mount the VXB 3/16 V groove bearings? I did look in the BOM, but may have missed it if it's there. The Bill Of Material feature is working now. You can check it out here. This is a database driven Bill of Materials. It is not 100% correct or complete yet, but it is easy to change and maintain. If you see any problems let me know. I know that there are a lot of missing supplier part numbers and prices. I need to take the time to enter those. I was actually quite surprised how cheap the Misumi framing is. I am working on a comprehensive Bill Of Materials. This will boil everything down to a basic shopping list. It should be ready in a few days. After about a 1000 requests, I have started making some kits. There is a page here detailing the kits. If you want any parts, please email me at bdring@buildlog.net. Please don't use the forum for kit requests. You need some sort of missing pulse detector. This can be done several ways. It could be as simple as a 555 timer or a microcontroller. I used a PsoC microcontroller initally and then a PIC. I actually don't have it hooked up now. I was planning to put it on my XMOS controller. I still have the flow sensor in the circuit and use it as a visual indicator of flow. Here are two incomplete web pages on the subject. do you need a special circuit with the INS-FM16 coolant flow meter? I assume that would be for etching. It might be hard to detect the distance exactly at the laser spot. How acurate are those distance sensors for spot size? The sensor would have to shoot at an angle to avoid the laser and that might throw off it's accuracy. Hitting a surface angled towards or away might throw the thing off too. I had an idea a while back about two laser pointers aiming from the each side. They would manually adjust to where they converge to one dot at the exact focal point. Any time you see two dots, you are out of focus. Something like a Wii remote could be used to auto focus the table. I was also thinking the other day that it could be done in software. Say for example you wanted to etch on a wine glass. Even if you had a rotation thingy, the wine glass is not at a constant diameter. You could program the table to compensate for it in software based on the geometry of the part. You also have the issue of the beam not hitting square to the surface when the surface height is changing quickly. That might degrade the image and might need to be compensated for in power. The new z-table looks great! Personally I'm much happer now that it's build out of the extrusion. Have you given any thought to an auto-focusing system? So that the z-axis could move to maintain a 55mm focus length on an uneven surface? i got a sample from the manufacturer is a plastic core with doubled painted aluminum . the thick is 3mm and come 9 different color. I couldn't find details on how thick the alum is. It would definitely be safer. I don't know how easy it is to work with. Do you know the price? what do you think about using this product for cover the laser cnc? Here is my new venting system. The flow is directly across the work area so the smoke basically disappears. I would get a few extra. Buy a lot of the cheap basic nuts and a bunch of post assembly nuts. The one's with the spring loaded ball are real handy for mounting the skins. They stay in place in vertical slots. how many corner from Misumi brackets do you need for the project? ...it's been finished several times. Actually, I did a few test cuts last night and checked the alignment. I am back in business. I have one more thing on this project's TO DO list. My old floor had the air intake with filter. I did not like this for two reasons. It did not do the best job of removing smoke near the top of the cabinet. I used to crack the cover open about 1/4" on smoky jobs. I was also worried about my new perforated table. If for some reason the beam went through the work, honeycomb and table and hit the filter I thought there was a chance for a fire. With a couple hundred CFM of air, things could get exciting quickly. The beam is way defocused by that point, but even a 2" diameter spot at 40W on paper could catch fire. I am moving the air intake to the middle front panel. Will you be able to alter the height during the work process (on the fly, so to speak) ?. Here is a picture and video of the completed Z. I think one of the shafts is still a little bent. You can still see and hear a tiny little shimmy (let's see Google translate that). I am OK with it as is though. I put aluminum perf stock on the top of the table I will put honeycomb on top of this, but I wanted the air to be able to blow through. I got new Z axis and table installed. I works well. It runs a lot faster, smoother and quieter than the chain drive version. One of the lead screws had a slight bend to it that cause a little wiggle in the table. I was able to strighten it by hand. I rolled it on a table to verify it was straight. One of the bearings for the lead screws was a mounted at a little angle that caused a little resistance to turning. That was easily fixed. When I cranked up the speed to "ludicrous speed" I was able to get the belt to walk off one of the fold back bearings. This was on the back right lead screw. When the belt is coming from a near by pulley, the pulley flange keeps it on the bearing. When coming from a distant fold back bearing and running fast, the the belt might bounce a little and allow walking off the bearing. I accidently bought 0.25" wide belts instead of 0.375" wide. The wider belt will probably self limit the walk before it can jump off. I slowed the speed to go full Z travel in about 8 seconds. It went up and down for about 10 minutes without a jump off. That is fast enough. I may even slow it down further, because it is usually run in jog mode to finely adjust the focus. Speed just makes it more touchy. I will take some pictures and a video soon. I got a lot of the parts for the Z axis today. I got the extrusions and the belts. I started by loosely assembling the parts onto the rails, making sure the belt looped through the pulleys and fold back bearings correctly. The parts were assembled close together so the tension of the belts was not making it difficult. Next I positioned the rear lead screws assemblies. I secured them tightly making sure the lead screws were perfectly vertical. I them positioned the front lead screw assemblies. I decided at the last minute to put the motor towards the front. It does not really change anything, but puts the trickiest part up close where it is easy to reach. I ran out of T-Nuts so I can't attach the table, but I set it in place to check the dimensions. It looks good. benwyne wrote: Regarding alternatives to the vgroove bearings, how about this? It seems to run along the aluminium extrusion itself. Problem is they don't seem to do one that would fit the current 2040 extrusion. Any thoughts? Regarding alternatives to the vgroove bearings, how about this? It seems to run along the aluminium extrusion itself. Problem is they don't seem to do one that would fit the current 2040 extrusion. Any thoughts? Do I gain one if I make one no idea what for but it looks super cool when its running. Willy, you loose one geek point for not knowing. It is a open source 3D printer. It uses a lot of laser cut parts. A forum reader is actually using a MakerBot to make a air assist nozzle for my laser design. Funny how that works out. That will get me all the parts early next week. I may cut a set of skins this weekend to get a feel for how much work it is. That is probably a little short. The width between the lead screws is fixed, but the depth can change by sliding on the t-slots. That allows various sizes of belts to be used. The ideal length is about 112". That puts the lead screws on the corners. That is not available, so you go down to the next size which is 103.2". This means you need to squeeze the depth to pull out 8.8". That means 4.4" out of each depth side of the belt. That sounds reasonable. If you pull out too much, the lead screws get too close together and the table will not be stable. If you put a lot of weight in front of the lead screws, the back might pop up. Removing the fold back bearings will reduce the required belt length by a few inches, but probably not enough to make the 86 inch belt work. I want to know how they make these belts. Do they mold them? Do they splice and vulcanize them? The fact that they sell huge unjoined lengths is a clue, but why do they show so few lengths? How can they make unstocked belts in a week? The Next belt from econobelt is 86" is that too small? Ha ha, I was just thinking about adding a spring loaded belt tensioner! I actually added springs to the V groove bearings on the gantry bracket to maintain contact with the rails. Adding a spring loaded idler to the Z axis is something I may add when I revise my Z Axis but that won’t happen any time soon. Yes, it takes no effort to move one of the lead screws. The engagement will have many times more force than the motor can deliver. The trick comes down to tension, slack, bounce, etc of the belt in the particular setup. It would be cool if you could make a spring loaded idler that is simpler than all the fold back bearings. I already have all the bearings installed, so I doublt I will test very soon. I just want to get my laser back. Keep in mind the scale of the makerbot; its Z axis is very small and light compared to yours and mine. Having said that, I’m confident that my design would work fine without the fold back bearings; the rods can be spun with just two fingers and minimal effort. I’m not sure how much force is required to spin your rods but if it’s similar to mine then you should be fine. You could try wrapping some of the belting you have on hand around the four corner pulleys and see if the belt slips when you raise and lower the Z axis. Yes, Econobelt is way cheaper than stock drive, at least for the belt. Unfortunately the belt needed is not in stock. No word on shipment yet. I am tempted to try it without the fold back bearings in the corners. I think it will work and will be simpler, cheaper... What do you think. Look at the top of a Makerbot. Kits will start when laser is back on line. Great, thanks for the information. I'm pretty impressed at how cheap the econobelt belts are! I have another question about the frame assembly. From the drawings you don't have offsets for the 3 horizontal aluminium pieces running along the back of the machine. Any chance these could be updated too? The timing belts for the XY assembly are MXL (0.080 pitch). They are open ended and cut to length. I suggest getting about 20 feet. That will get you all three belts, plus enough to replace one if something goes wrong or breaks. I used Stock Drive 1/4 wide p/n A 6Z16-C025. For the pulleys, I used plastic 1/4" bore 18 tooth with metal insert and 2 flanges p/n A 6T16-020DF2508 in all six locations. you need to verify your motor shaft size. The Z lift is XL (0.200 pitch). For the pulleys I used plastic 5/16 bore 14 tooth with metal insert and 2 flanges p/n A 6Z_3-14DF03710 for the lead screw (qty 4). I used plastic 1/4 bore 10 tooth with metal insert and 2 flanges p/n A 6Z 3-10DF03708...again...check your motor shaft. Everything above is from Stock Drive. I bought the Z belt from econobelt p/n QB-XL1032-025. I'll put this all on the drawings soon. Update: Information has been put on the drawings. What timing belts and pulleys are you using? I'm guessing the MXL belts from econobelt? Do you have a complete list of parts for both x/y/z axis belts and pulleys used? I'm looking to buy all the belts and pulleys from econobelt in the next day or so. Thanks! Put me at top of the list of kit purchase. [quote="bdring"]The new versions of the drawings have been posted on the [url=http://www.buildlog.net/cnc_laser/drawings.html]drawings page[/url]. This includes all the new Z lift drawings and mods to the gantry to get the motor above the extrusion. I am going to work towards the part kits next. The assembly drawings need a lot of clean up, but that should be usable anyway. I would use four v bearings on the y for stability. The new versions of the drawings have been posted on the drawings page. This includes all the new Z lift drawings and mods to the gantry to get the motor above the extrusion. I am going to work towards the part kits next. The assembly drawings need a lot of clean up, but that should be usable anyway. My laser will be down for at least a week while I wait for for the belt. I should be ready to start cutting after that. It attaches from the bottom with two screws. You mount it lightly, then slide the belt ends in from the side. Tighten the clamp. Then tension the belt. I hope to post the drawings tonight. This affects a lot of drawing, some only visually. I want to post everything at once, so there is no period where old and new are on at the same time. Looks great! I like the way your new belt clamp supports the belt; it also appears stronger than previous designs. Does the new clamp attach the same way as previous clamps? Here are the mods to the gantry. The putting the motor above gives maximum clearance of the table. My previous design had to allow clearance for the motor along the left side. Now you get about 2" inches of travel. The assembly is actually easier to assembly and uses less parts. The belt is tensioned by moving the motor to the left as it is tightened. I measured the belt length using a piece of wrapping paper ribbon. It measured about 113" which is right about what the CAD model said. The ribbon actually worked. . The tricky one to thread is the one with the motor. I may move that to the front. I am sure it will be easier with a real belt that has some stiffness. Econobelt has a 103" and a 122". I think it will be easier to to move the lead screws together, so I will go with the 103" I ordered three belts. I wonder how they make these belts. I can't imagine they have a mold for each one.